If you think you’re a football champ, Good Earth City Center’s Oh My Game will challenge that by putting you into a zorb bubble and making you play the game. 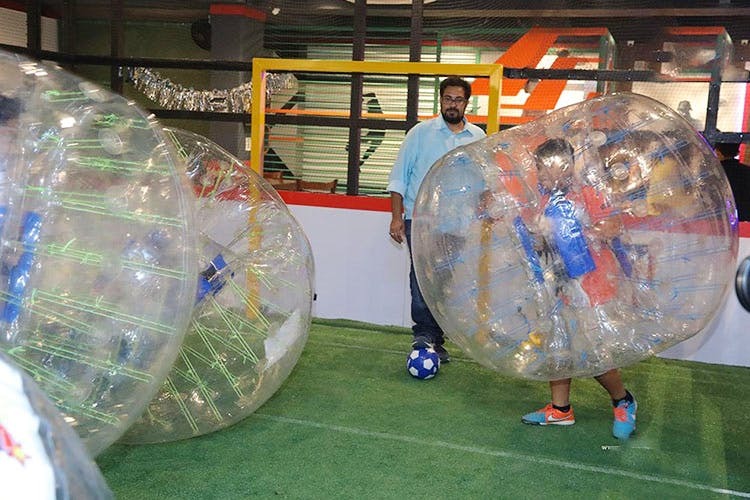 People have been going crazy over zorb bubbles for a while now and we’re sure it is a great feeling but add some footie to that to make it super interesting. And don’t worry about having played football before because the rules at Oh My Game are entirely different. The game is played with only five players per team and each half is only five minutes long. But the real tough part is to be inside a zorb bubble and score a goal against your opponent while making sure you knock them down too! That is the only way to win it. With you and your squad wrapped up in zorb bubbles, you don’t even need to stress over getting hurt. Good Earth City Center’s Oh My Game really knows how to keep people coming back with this super fun version of footie called Bubble Football. If you love the prospect of playing some fun sports wrapped up in a bubble, gather your squad for a game. India's Largest Laser Tag Arena Is Right In Your Backyard–Been There Yet?